Here at Stephen Caffyn Landscape Design we find ourselves increasingly involved in leading Cycling infrastructure projects. In this regard, we have expanded our scope of services from Landscape Architecture, Environmental Planning, and Urban Design, to include Cycling Consultancy Services. We have built up this expertise in cycling infrastructure in the course of developing strategies, cycling standards, and track treatments, and carrying out cycling audits for various Government Agency clients in Singapore. The move to promote and provide infrastructure for alternative, sustainable transport such as cycling in Singapore is encouraging. Our initial work on the Round Island Route (RIR) Masterplan, which focused on Corridor A (subsequently designated as the Eco Discovery Trail), led to our appointment for the Round Island Route Coastal Adventure (Corridor B), the first 63 km phase of the Round Island Route to be fully developed, and further research and development of cycling infrastructure strategies and treatments. SCLD's Round Island Route Plan indicating the 3no Corridors of the RIR from the 2010 Masterplanning project. Round Island Route Coastal Adventure - Visualizations and the Proposed Facilities at two of the RIR Nodes. This pioneering work on the RIR project was quickly overtaken by our Land Transport Authority (LTA) Cycle Network project, where the strategies and standards we developed were quickly implemented on the ground at locations such as Ang Mo Kio. The first phase of the Cycle Network was opened by the Prime Minister, Mr Lee Hsien Leong, on the 9th of July 2016. Straits Times Article on Ang Mo Kio Cycling and Walking Town. 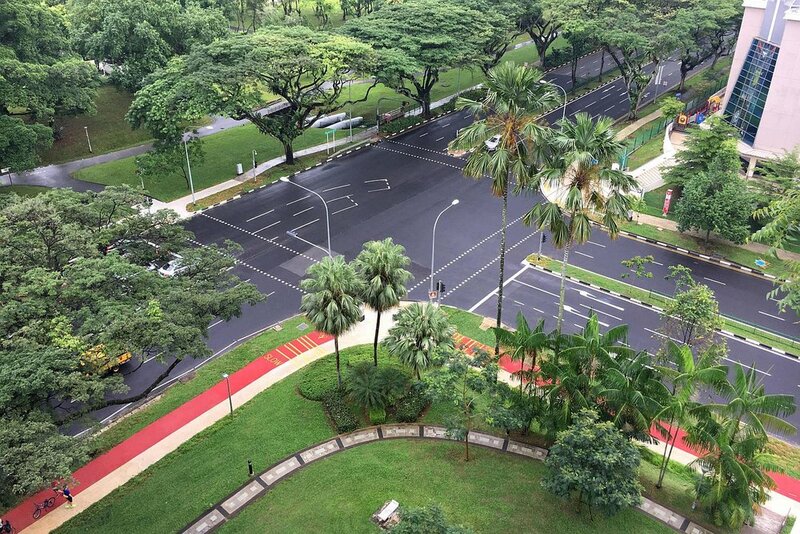 Above: Photos of the completed areas of the Ang Mo Kio Cycling Network along with Graphic and Visualization Studies. For the LTA Cycle Networks we quickly fine-tuned our cycle track strategies for the urban situation where, with limited track widths, and frequent road and footpath junctions, there was even greater potential for conflicts between pedestrians, cyclists, and road users. The same day (9th July 2016) the Prime Minister also planted at tree at Sengkang Riverside Park to launch our Round Island Route, Coastal Adventure project. NB. This Straits Times article shows our rather nice visualisations including movies of selected parts of the proposed Round Island Route. The movies have unfortunately been cut badly and speeded up (by others). Our original movies can all be found on our YouTube Channel here: Stephen Caffyn Landscape Design or watch an example below. Our work on the LTA Cycling Network and Round Island Route Coastal Adventure is still ongoing and has moved into construction stage. Our latest cycling infrastructure project is the Bishan to City Feasibility Study for the Urban Redevelopment Authority (URA). 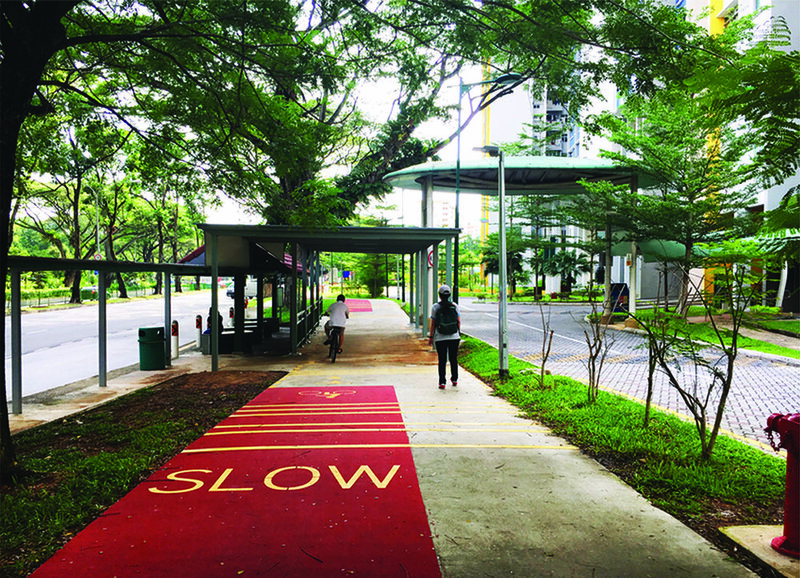 This project aims to propose and determine the technical feasibility of building a series of pedestrian and cyclist friendly crossings along the Kallang Park Connector to create a seamless route. We also carried out detailed cycling audits for this project in order to objectively assess each of the possible route options and crossing methods proposed. Singapore and other cities are now facing a rapidly changing situation with the advent of multiple bike sharing operators, and use of the increasingly popular personal mobility devices such as electric scooters, bikes, and multiple self-balancing boards and mono wheels. Legislation and guidelines covering the use of these personal mobility devices in different situations is still catching up with the surge in ownership. Round Island Route (RIR) Masterplanning, Eco Discovery Corridor – SCLD’s initial masterplanning project for National Parks Board (NParks). The masterplan addressed the overall 150km Cycle and Footpath that will be circumnavigate Singapore with a specific focus on Corridor A (Eco Discovery) from Jurong up to Lim Chu Kang, and the north coast through Woodlands to Lower Seletar Reservoir. Round Island Route (RIR) Coastal Adventure – A project with NParks to develop the first 63km of the 150km Round Island Route Cycle and Footpath that will circumnavigate Singapore. This portion of the route connects and integrates with existing coastal parks, the park connector network, places of interest, and cultural and natural heritage sites. We designed to promote recreation, and balance the need to conserve and improve habitats and biodiversity, with provision of visitor essentials such as safe track typologies and signage, and key services such as toilets, shelters, and other facilities. LTA Cycling Network – LTA project in which we developed the cycling standards and treatments for urban cycling paths and designed and applied these to the specific network routes and treatments for the HDB towns of Ang Mo Kio, Bishan, Toa Payoh, Choa Chu Kang, Bukit Panjang, and Woodlands. Total length of Cycle Network is 75km. Bishan to City Feasibility Study – URA commissioned study to determine the technical feasibility of a series of pedestrian and cycling friendly crossings along the Kallang Park Connector with the aim of creating a seamless route with the aim of creating a seamless route from Bishan to Gardens by the Bay. We also include all the features and functionality required by future users such as commuters, tourists, and local recreational users. Out of necessity for these projects we now have 2no. folding office bikes. All plans, graphics, and photos are produced by SCLD.